^ Lees P, Cunningham FM, Elliott J (2004). "Principles of pharmacodynamics and their applications in veterinary pharmacology". J. Vet. Pharmacol. Ther. 27 (6): 397–414. ^ Carruthers SG (February 1980). "Duration of drug action". Am. Fam. Physician 21 (2): 119–26. ^ Vauquelin G, Charlton SJ (October 2010). "Long-lasting target binding and rebinding as mechanisms to prolong in vivo drug action". Br. J. Pharmacol. 161 (3): 488–508. ^ Ruffolo RR Jr (December 1982). "Review important concepts of receptor theory". J. Auton. Pharmacol. 2 (4): 277–295. ^ Dhalla AK, Shryock JC, Shreeniwas R, Belardinelli L (2003). "Pharmacology and therapeutic applications of A1 adenosine receptor ligands". Curr. Top. Med. Chem. 3 (4): 369–385. ^ Gesztelyi R, Kiss Z, Wachal Z, Juhasz B, Bombicz M, Csepanyi E, Pak K, Zsuga J, Papp C, Galajda Z, Branzaniuc K, Porszasz R, Szentmiklosi AJ, Tosaki A (2013). "The surmountable effect of FSCPX, an irreversible A(1) adenosine receptor antagonist, on the negative inotropic action of A(1) adenosine receptor full agonists in isolated guinea pig left atria". Arch. Pharm. Res. 36 (3): 293–305. Pharmacokinetics and pharmacodynamics are termed toxicokinetics and toxicodynamics in the field of ecotoxicology. Here, the focus is on toxic effects on a wide range of organisms. The corresponding models are called toxicokinetic-toxicodynamic models (more details can be found at Ecotoxmodels.org). 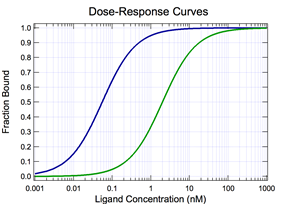 where L=ligand (drug), R=receptor (attachment site), reaction dynamics that can be studied mathematically through tools such as free energy maps. Pharmacodynamics is often summarized as the study of what a drug does to the body, whereas pharmacokinetics is the study of what the body does to a drug. Pharmacodynamics is sometimes abbreviated as "PD", while pharmacokinetics can be referred to as "PK". See PK/PD models.